“Wat is enne Hotpixel ? Da stelle mer uns mal janz dumm. Enne Kamera, dat is enne jroße schwatze Raum. Auf de eine Seite, da kommt et Lischt rein, und auf de andere Seite da is de Sensor. De Sensor hat ville Pixel. De sinn alle janz schwatz, un nur wenn Lischt drauf fällt sinn se nich mehr schwatz. Nu zu de Hotpixel. Dat is wenn enne Pixel jar kein Lischt bekommt und et trotzdem sacht, dat es nit schwatz is. Dat siehsse dann als helle Punkt im Bild, wo jar keine helle Punkt is”. (Short story for all non-Germans: A hotpixel is a defective pixel on the image sensor which produces a signal even if no light falls on it. Therefore you see a glowing pixel in the image even when the area should be black). 1.) We are talking about one single pixel out of 12 million (for the D300s). In some programs like Adobe Lightroom the denoising filter already kills this effect and interpolates the missing information. Actually I only see the hotpixel on the camera screen of the D300s, when I import the pic into Lightroom is is magicked away by some shiny computer algorithm. Therefore the above post title picture is a photo of the camera screen, because otherwise I could not show the hotpixel to you. 2.) The effect is only visible on dark images. When the area on the photo where the hotpixel is located is bright the surrounding pixels will be equally or similar bright than the hotpixel. 3.) The hotpixel effect is only visible with high ISO values. 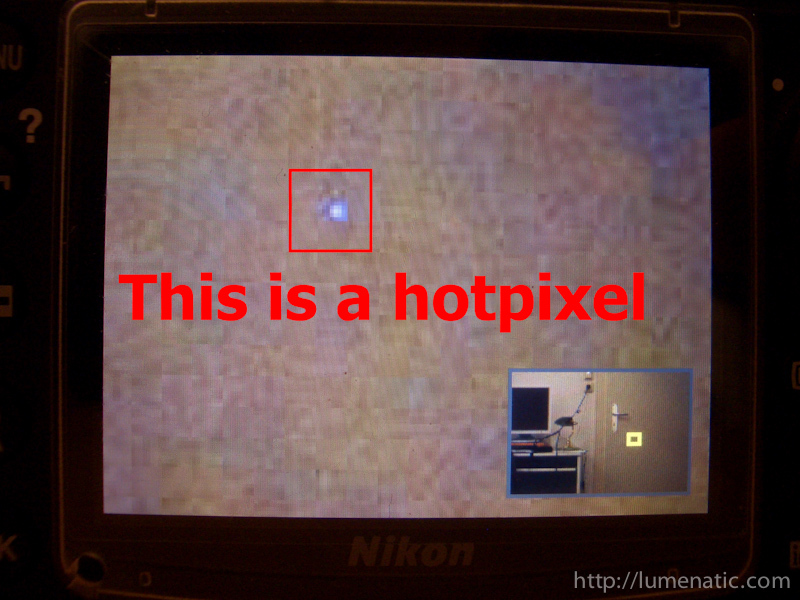 This might not be true for all hotpixels on this planet, but certainly valid for mine (hotpixel, not planet). At ISO 200 (“normal” setting) it is not visible. At ISO 320 it becomes visible as a faint glow, at ISO 800 it burns bright. Why is that so ? Pixels are light- sensitive elements, small solar cells or photo diodes if you like. Light comes in, electricity goes out. Boosting the ISO means, that the electrical signal from each individual pixel is electrically amplified. The more ISO you give, the more the signal is cranked up. This allows you to take a picture even under low light conditions, but also an error is introduced by the amplification process. This error is what the photographer calls “noise”. Therefore the hotpixel glows stronger the more ISO you have set. And considering that one always uses the lowest ISO setting possible the effect should not affect the majority of your pictures. This is absolutely possible, Mr. Whiner. Cloning tool to the rescue ! And once again Copy/Paste-man saved the day !